Stadio Friuli – Dacia Arena is a multi-purpose stadium (See the running track), used the majority of time for Football matches for the Serie A side Udinese. The ground opened in 1976 replacing the Stadio Moretti and is currently undergoing redevelopment plans in order to modernise the stands and club facilities by late 2015. Stadio Friuli first opened in 1976 with a capacity of 41,652 where it replaced the club’s former home Stadio Moretti which was beginning to show its age having first opened in 1920. Publicly funded, the ground was designed to be multi-purpose and thus an athletics track was installed around the perimeter of the pitch as well as an indoor gym and sports halls. Constructed at a time when the club was languishing in Serie C, the project spearheaded by the Mayor of Udine, Candolini Angelo, was undoubtedly a success and ultimately served as a springboard to the club establishing itself as a permanent fixture in Serie A less than 20 years later. Inspired by the Olympiastadion in Munich and Rome’s Stadio Olimpico, the design by Lorenzo Moore was regarded as cutting edge for its day. At the time it was one of the most modern grounds in Italy and Subsequently it was nominated as one of the host stadiums of the 1990 World Cup. Nevertheless it underwent over 5 billion lire worth of refurbishment although the structure of the stands didn’t change. Designated as the main ground of Group E, it three matches in total featuring two games of Uruguay, Spain and South Korea. During the 2005/2006 season when Udinese qualified against all odds for the Champions League UEFA Stadium regulations required that the two curvas be fitted with plastic seating, as they deemed the bare concrete steps to be unsafe. This allowed Udinese to play in the group stages were they drew the likes of Barcelona, Werder Bremen and Panathinaikos. 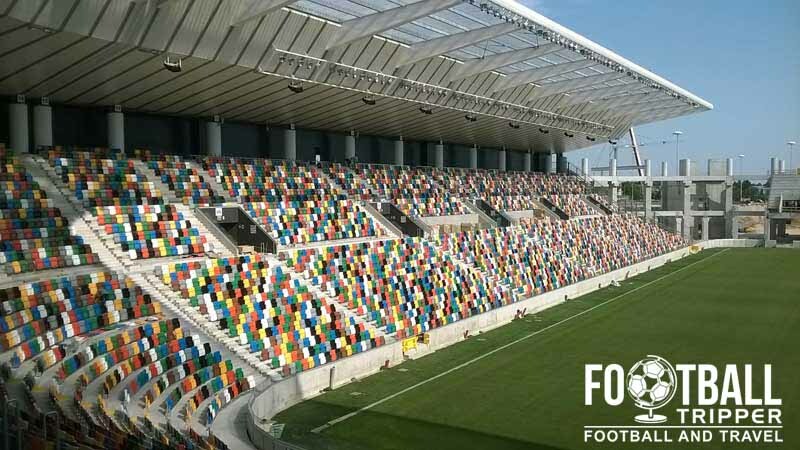 Currently Stadio Friuli is undergoing an estimated €40 million worth of renovation work to transform it into a modern all-seater stadium in line with other grounds across Europe. With the exception of the iconic curved main stand, the remaining three stands are being demolished and completely rebuilt which will result in a fully covered arena capable of seating 25,000 fans. The Friuli is comprised of four distinct sections: Curva Nord, Distinti Centrale (East), Curva Sud and Tribuna Centrale (West). Away fans who make the trip to the Friuli are housed within the south-west corner between the Curva Sud and the impressively large Tribuna Centrale. 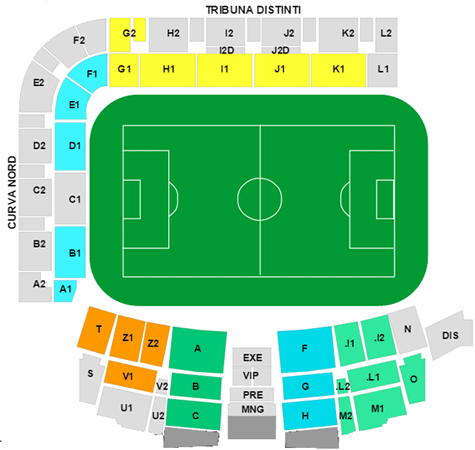 Sometimes refereed to as the Curva Ospiti which loosely translated as Guest Stand, the above seating plan shows that tickets are distributed amongst sections T, U, R and Q. The standard allocation of tickets within the away section appears to be just under 1,000 for league matches, however such is the lack of away fans culture in Italy for the majority of clubs, it is very rare to see this filled on a regularly basis. When Udinese have played in Europe in the past, it has not been uncommon for the entirety of the Curva Sud to be taken over by away fans with a 2012 Europa League match against PAOK reportedly attracting over 5,000 supporters. The historic city centre is in a compact zone marked out by a ring road comprised of four separate streets on each point of the compass. It is within this area that you will find the majority of Udine’s bars and restaurants as shown as the map below. 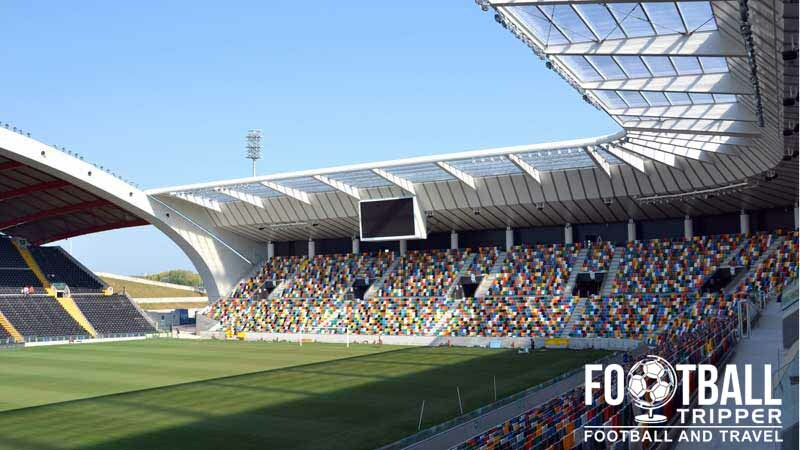 As the Stadio Friuli is located on the outskirts of the city there really isn’t much in the way of bars or restaurants so you can either get something in the city centre before or at the stadium itself, although the range of food options is nothing like it is in England. Udinese operate a club shop at Stadio Friuli and one in the centre of town in addition to an official online store which is a great place to browse merchandise before making your trip. Shop assistant posing with a Di Natale’s t shirt. The shop in the centre of town is located on Via Portanuova 1, Udine, and is open Tuesday to Saturday 9.30 – 12.30 and 15.30 to 19.30. 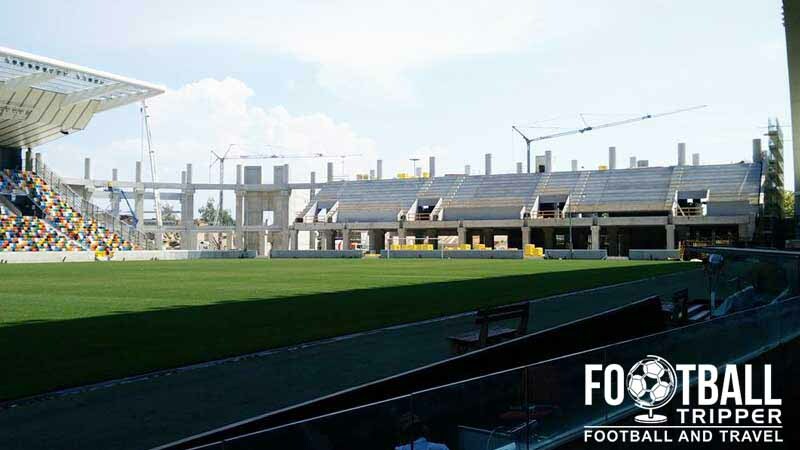 Currently Udinese do not run stadium tours of the Friuli but I expect that this may change when the redevelopment is complete in 2016, and the club finally have a stadium they’re really proud of. 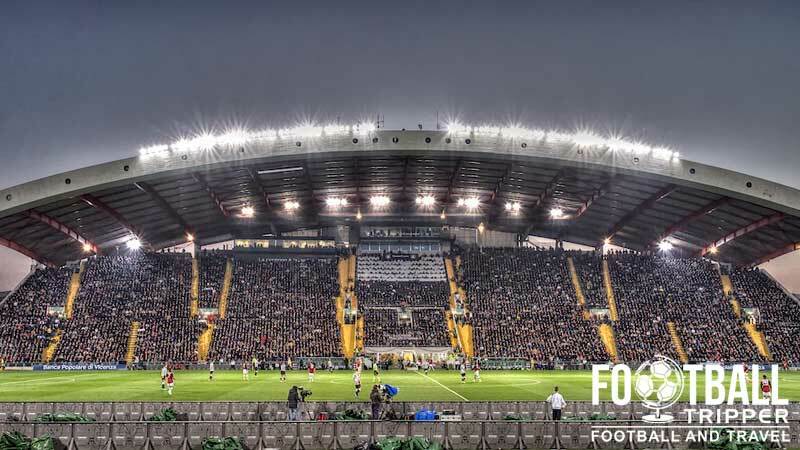 Tickets to see Udinese play at home can be purchased online, or in person at the ticket office at the Udinese Club Shop in the weeks leading up to the match. The above prices represented Category A matches against both Milan teams, and thus appear to be more expensive than normally is the case. For a run of the mill match expect to pay much less for a ticket, often usually half of the stated prices. Stadio Friuli is located approximately 4.8 km northwest of the city centre, very much in an archetypical out of town location in Rizzi. The famous arch of the main stand truly dominated the skyline around the stadium. It will soon be joined by a new horseshoe shaped structure which will consist of three fully-covered stands. Sitting just of the A-23 motorway which is connected to Austria, driving there is a viable option from certain parts of Europe, as well as from those travelling from the rest of Italy with the main southerly motorway section going past the city of Venice. Piazzale Repubblica Argentina, 3, 33100, Province of Udine, Italy. There is ample on-site parking around Stadio Friuli but unfortunately I’m not sure of the cost. It’s probably a few euros max so make sure you bring some change. The main train station in Udinese is the Stazione Di Udine which is towards the Southern part of the main city centre marked by the Viale Europa Unita road section of road. Unfortunately there are no direct trains to Stadium Friuli meaning you will either have to walk (one hour), get a taxi (15 minutes) or get the bus (see below). Inside Udine Railway Station. There are seven tracks in total and it is the busiest within the Friuli-Venezia Giulia in terms of passengers, serving over 7.6 million a year. Buses depart from outside Udine Stazione on Viale Europa Unita every 15-20 minutes on matchdays, with numbers 2 or 9 taking you no more than a 10 minutes walk away from the stadium. The journey once you are on the bus is usually anywhere between 20 – 30 minutes. Fly to Venice Marco Polo Airport which takes just over an hour to get to Udine. Fly to Venice’s second airport called Treviso which is slightly further away. And the final and closest option is to fly to the Trieste Airport, which is just 30 minutes away. There’s not really a single flight or airport which will be cheaper so it’s worth comparing all the prices. The closest hotels to the ground are probably the Hotel Alle Due Palme and the Hotel Friuli, with the Astoria Hotel Italia a bit further away, but closer to the station being very highly rated by customers.